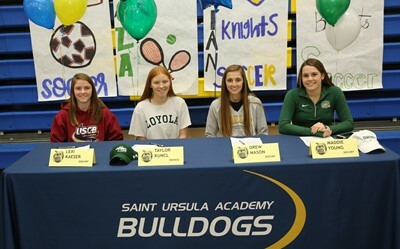 Saint Ursula Academy is proud to release the list of seniors who participated in the winter athletic signing ceremony on Thursday, February 7, 2019 to announce their intent to play college sports. Lexi Kaeser of Green Twp., daughter of Connie and Ray Kaeser, will play soccer at the University of South Carolina, Beaufort. Taylor Kuncl of Anderson Twp., daughter of Kimberly and Tom Kuncl, will play tennis at Loyola University, Maryland. Drew Mason of Green Twp., daughter of Sean and Lee Mason, will play soccer at Marian University. Maddie Young of Delhi, daughter of Anne Young, will play soccer at Ohio University. Lexi Kaeser will play soccer next year for the University of South Carolina Beaufort. Located in Bluffton, South Carolina, USCB plays in the Sun Conference of the NAIA. Lexi will be playing with her fellow Sand Sharks at the appropriately named Fin Land Field. She has played soccer since the age of 3. Lexi played four years of soccer for the Bulldogs, participating on the JVB team her freshman year, the JVA team her sophomore year, and then as center mid and center forward on the varsity team her junior and senior year. Lexi also played for 6 years for club team, TFA. Lexi’s accomplishments on the soccer field earned her GGCL Second Team All Star recognition in 2017, GGCL First Team All Star recognition in 2018, All Southwest Ohio in 2017-18, and All City in 2018. Lexi has been on SUA’s First Honors academic honor roll all 4 years and is a member of the National Honor Society. She is a Student Outreach Services leader for St. Margaret Hall and is active in the SODA Club and Ski Club. In addition to all of these activities, Lexi is currently playing varsity basketball for the Bulldogs this season. Taylor Kuncl will play tennis next year for Loyola University Maryland. Loyola University, located in Baltimore, Maryland, is a Division 1 school and competes in the Patriot League. Next year, Taylor will hit aces and winners at her new tennis home, the McClure Tennis Center on Loyola’s campus. While at Saint Ursula, Taylor played her freshman, sophomore and junior year on the Bulldog varsity tennis team. Taylor was part of highly successful doubles teams that earned GGCL First Team distinction each of her years and First Team All City each of her years. Taylor is extremely competitive in regional and national tournaments, earning a top 20 ranking in Ohio, top 100 ranking in Midwest, and top 500 ranking in the nation. While playing tennis for the Bulldogs, Taylor also succeeded in the classroom, being named to the Saint Ursula academic honor roll in every quarter. Taylor is the co-founder of the Fashion Club and participates in the Competitive Crafting Club, Student Outreach Services, and Students for Advancement. Drew Mason will play soccer next year for Marian University. Marian University, located in Indianapolis, Indiana, plays in the Crossroads League of the NAIA. Drew will play with her fellow Knights next year at St. Vincent Field. In her four years at SUA, Drew played both soccer and basketball for the Bulldogs. Her freshman year, she played JVA soccer and JV and varsity basketball. She spent the next three years playing varsity soccer, and paired that with varsity basketball her sophomore and senior year. Drew was part of the soccer GGCL champion teams her freshman and junior year. She was the 5th leading scorer in the GGCL her sophomore year, when she received All City Honorable Mention, and was instrumental in the team winning the District title that year. Her play earned her GGCL Second Team distinction this past season. As part of the club TFA, Drew’s play helped the team win the National League division championship, be a finalist in the State Cup, be a Regional Semi-Finalist, and have a 3rd place finish at Nationals in Frisco, Texas. Drew’s academic work earned her second honors distinction on Saint Ursula’s honor roll and she is a member of the National Honor Society. Drew has been part of the Food and Nutrition Club and enjoys volunteering at Stepping Stones. Maddie Young will play soccer next year for Ohio University. OU, located in Athens, Ohio, plays in the Division 1 Mid-American Conference. Maddie will play for the Bobcats at Chessa Field. Maddie played four years of soccer for the Bulldogs, on the JVA team her freshman year and then three years as a starter on the varsity soccer team. Maddie has been recognized numerous times with GGCL honors and All City recognition. She was First Team GGCL and First Team All City her sophomore year, when she was the top scorer in the GGCL with 14 goals and 4 assists and helped the Bulldogs win the District Championship. She was in the top 10 scorers of the GGCL her junior and senior years, where she earned Second Team GGCL distinction and was named to the Second Team All City Team. Maddie earned Academic All Southwest all four years she played soccer at SUA. As a member of the Cincinnati Development Academy, Maddie has been part of successful teams, including the 2017 runner up team in the Kentucky State Cup and Midwest Regionals, the 2017 and 2018 MRL champion team, and the 2018 Ohio South State Cup champion team. Maddie is just as successful in the classroom, earning a spot on the Saint Ursula academic honor roll each quarter she has been at SUA. Maddie was inducted into the National Honor Society her junior year and has been a Saint Ursula Ambassador and active member of the Student Council for all four years.